I finished this project awhile ago, but couldn't share since it was a surprise. 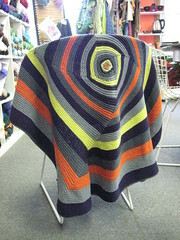 This is OpArt from Knitty, a very clever, very simple and very versatile pattern! I knit this for Cara's new baby Cali, although at the time of the knitting was not sure if the recipient was going to be a girl or boy. I used Brown Sheep Cotton Fleece and cannot say enough good things about this yarn. Flair and I went a-visiting on Sunday and I got to smooch sweet baby cheeks! So now I can come clean with some recent knitting projects. btw — I made another little baby sun hat with the leftovers, but didn't snap a picture.